13 Jalan 16/11, Petaling Jaya. Business hours: Daily, 6.00am to 1.00am. WHO doesn’t like a good lamb varuval? Just the thought of tender chunks of meat cooked in a rich masala concoction can make anyone salivate with anticipation. As we usher Deepavali, Swez Brasserie at Eastin Hotel Petaling Jaya has come up with the Flavours of India buffet which features some interesting dishes such as Lamb Pasanda, Murgh Makani, Fish Kolhapuri and Methi Prawns. 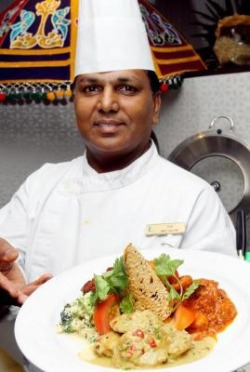 Personal touch:Abraham presents traditional recipes improvised by him for the Flavours of India buffet. Headed by Eastin’s senior sous chef Sam Abraham, this is a must-try for Indian food lovers as Abraham has taken old recipes from various villages in North and South India and tweaked the dishes to suit the Malaysian palate. While some of the dishes are less spicy than what one would expect for a curry, Abraham’s rationale is that he wanted to cater for customers who do not take food that is too spicy. “Customers will get a mixed variation of traditional North and South Indian dishes and to add to that, we will have action stations serving fresh thosai, capati and puri as well as tandoori chicken and naan bread,” said Abraham. What goes well with Indian food? Lassi, of course. Abraham said they would offer a variety of flavours including mango, orange, honeydew and sour lassi. You should definitely try the honeydew. As for the hot dishes, the Lamb Pasanda originates from the village of Andhra Pradesh in India. It is cooked with coriander, herbs, cashewnuts, yoghurt and cream. 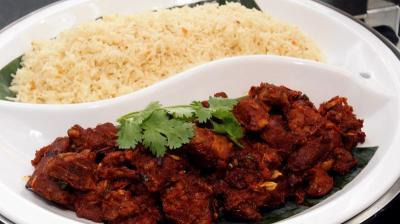 The buffet will also feature Mutton Chukka, which is a dish from the Chettinad region of Tamil Nadu. “It is cooked with white vinegar, yoghurt and other spices and reduced to a dry texture.” ‘Chukka’ means dry in Tamil. The Murgh Makhani or butter chicken is tasty as it should be. The Fish Kolhapuri comes from South India and is cooked with fresh chillies, tomatoes, coriander and cashewnuts. Having 30 years of experience as a chef, Taiping-born Abraham infuses his culinary knowledge into the dishes while presenting the authenticity of traditional village food. Some of the recipes were picked up during his travels to India, but some were his own. “For the Fish Tikka, I mix the spices myself and improvise the recipe to cater for customers,” he said. Apart from varuval, who doesn’t love a good serving of peratal curry? You will be spoilt for choice this time as the buffet will have four different types of peratal — vegetable, prawn, chicken and crab. The Flavours of India buffet will feature four menu choices on a rotation basis. After a hearty meal, there is nothing better than appeasing your sweet tooth with their range of desserts which include Homemade Halwa, Gulab Jammun, Payasam and Keseri. The buffet at Swez Brasserie is available from Nov 1 to 18 from 6.30pm to 10pm and priced at RM88++ (per adult) and RM44++ (per child).